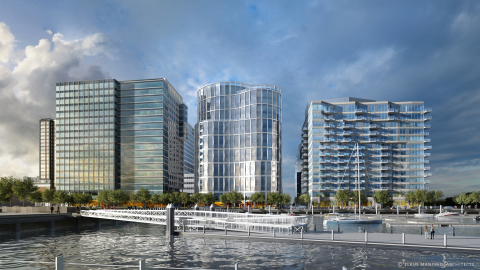 Massachusetts Mutual Life Insurance Co. (MassMutual) today unveiled architectural renderings of 10 Fan Pier Boulevard, a 17-story commercial tower located at Fan Pier on Boston's Waterfront. The building will serve as MassMutual's new Boston campus, as the company expands its presence in the city and across Massachusetts. MassMutual is working with The Fallon Company to develop the build-to-suit tower that enhances the streetscape of the mixed-use neighborhood with a unique, undulating façade. Located in the dynamic Seaport District, the new tower will offer 310,000 square feet of waterfront commercial space including prime, ground-floor retail opportunities and a 5,900 square foot outdoor public plaza facing the marina. The tower design includes an architecturally striking rounded exterior wall, outdoor and rooftop terraces, and a distinct glass façade with faceted panels set in different planes to accentuate the building's curvature and capture the shifting reflections of sunlight and shadow throughout the day. "We look forward to growing our presence in one of the state's most exciting and vibrant areas and building our campus at Fan Pier, which will be a standout piece of architecture in the city," said Roger Crandall, MassMutual Chairman, President & CEO. "Our location in the Seaport will offer our employees proximity to the city's amenities, allow us to tap into its expansive talent pool and innovative spirit, and better position us to best serve our policyowners for generations to come." "10 Fan Pier Boulevard provides a fresh perspective on commercial design in the Seaport," said David Manfredi, Elkus Manfredi Architects CEO and Founding Principal. "The curvaceous façade adds visual interest to the neighborhood and beautifully draws inspiration from the movement and feeling of the harbor it reflects, a characteristic further reinforced by the building's flowing landscape design and signature water feature, while mirroring the vitality of Fan Pier." Spanning 21 acres and nine city blocks, Fan Pier encompasses three million square feet of commercial and residential real estate, ample public spaces, a world-class marina, dining and retail destinations, and direct access to a variety of transportation options on Boston's waterfront. The new Boston campus is an integral part of MassMutual's plan to expand and reinvest in Massachusetts over the next several years, as announced earlier this year. MassMutual's headquarters will remain in Springfield, Mass., and the company is in the process of consolidating certain facilities in other parts of the country. The 167-year-old mutual life insurance company will be growing its operations in the Commonwealth, increasing its Massachusetts workforce by approximately 70 percent by adding 2,000 jobs in the state and investing nearly $300 million into the Commonwealth. To learn more about MassMutual's employment opportunities, visit https://www.massmutual.com/about-us/careers. The Fallon Company is a privately held commercial real estate owner and developer headquartered in Boston, Massachusetts. Founded by Joseph F. Fallon in 1993, The Fallon Company has developed over $4 billion in real estate, representing more than six million square feet of property. They are proudly recognized as a leader in mixed-use urban development and one of the most active private developers on the East Coast. Fallon brings to their projects a unique focus on large-scale urban design geared toward transforming neighborhoods into cohesive, community-driven environments. With offices in Boston and Charlotte, The Fallon Company has the capacity and resources to undertake projects throughout the United States. For more information about The Fallon Company, visit www.falloncompany.com.